One of the downsides to my early morning running schedule is that I'm pretty tired by the time I drag myself home from work in the afternoon. This afternoon, for example - my legs felt heavy all day from my interval workout this morning, and I wasn't feeling up to my afternoon core strength session. I collected three different core workouts from different places - a floor core routine from Runner's World, a medicine ball set from Runnerdude's blog, and a yoga ball workout from somewhere else on the internet. 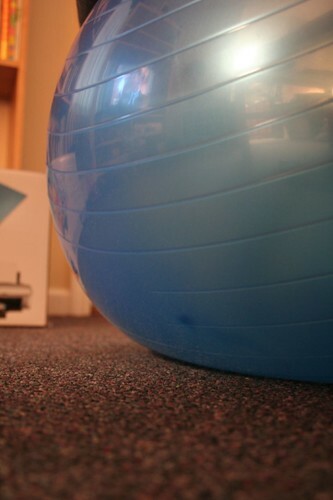 They get rotated through - the Runner's World set on Mondays and Thursdays, the yoga ball on Tuesdays and Fridays, and the medicine ball on Wednesdays. Fortunately, to day was Tuesday - the yoga ball workout is the easiest of the three, and I was able to talk myself into doing it.